TORONTO, ON--(Marketwired - Jan 27, 2014) - While plenty of couples find it easy enough to commit to each other, committing to a wedding venue can be surprisingly difficult. Yet for those planning a wedding in Toronto, hesitation has gone the way of the powder-blue tux, thanks to the Toronto Airport Marriott Hotel. Offering couples versatile spaces, a convenient location and, courtesy of its latest wedding promotion, free honeymoons, this is one luxury Toronto hotel that makes it easy to commit to the first stages of planning a wedding. The promotion rewards couples who book their receptions at this Toronto Airport wedding venue with substantial Marriott Rewards bonus points. Couples can earn up to 250,000 points, in fact, depending upon their total food-and-beverage expenditures. A $15,000 reception, for instance, earns a couple 150,000 bonus points, while a $20,000 reception yields 200,000 points. What the happy couple chooses to do with the windfall is up to them. They can enjoy a week's worth of accommodations at one of the more than 3,800 Marriott-branded properties around the world, or use them to book a golf or ski package. Or they can indulge in spa treatments, meals or even resort activities to create the honeymoon of their dreams. The Marriott Rewards points feel like an especially generous wedding gift to those enjoying the many advantages of this reception venue near the Toronto Airport. With 20,000 square feet of event space and a dedicated team of on-site event planners, the hotel seems ideally suited to creating the perfect party. A skilled culinary team complements the event planners, so that those looking for an ethnically-inspired feast, a themed event or an elegantly traditional affair can create their ideal menu and setting. Style selections aside, this hotel near Pearson Airport is also expertly equipped to handle the brass tacks of wedding planning. Ample underground parking means guests won't waste time schlepping across miles of parking lot in their heels and tuxedos, and the property's ideal location is easy to reach from all points of town. To secure the promotion, couples must book their wedding reception by December 31, 2014 and hold it by December 31, 2015. To learn more about the details, couples can visit www.MarriottCanadaWeddings.com and www.MarriottCanadaMariage.ca. Travellers can easily tap into the energy of this vibrant city when they stay at the Toronto Airport Marriott Hotel. Located just minutes (and a complimentary shuttle ride) away from the Toronto Pearson International Airport, the hotel is also just 20 minutes away from downtown Toronto's many attractions, like the CN Tower and the Royal Woodbine Golf Club. Inside the hotel, guests enjoy luxury bedding, high-speed Internet access, soundproof windows and, for those who appreciate indulgence, Concierge Level suites. A Starbucks café and a lounge complement the hotel's restaurant, Bistro West by East, where visitors can taste the best of Canadian culinary traditions. An on-site fitness centre, indoor pool and sauna offer plenty of opportunities to infuse a trip with rest and relaxation, while the Games Room is perfect for families who want to play air hockey or video games. Corporate travellers, meanwhile, enjoy every convenience within the 21 meeting rooms as well as an easy commute to the International Centre and the Toronto Congress Centre. 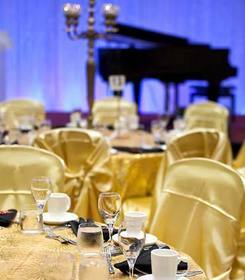 With 20,000 square feet of event space and a dedicated team of on-site event planners, the hotel seems ideally suited to creating the perfect party.